Warm up your TV and mark your calendar for 8:00 p.m. EDT on Sunday, March 8. That’s the date and time set for the premiere airing of the one-hour SEMA Battle of the Builders program on the Velocity Network—an in-depth TV event promising to focus new consumer attention on the creativity, products and vehicle builds of the annual SEMA Show. 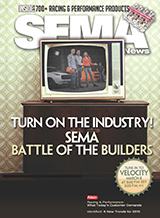 “We’re extremely excited about the upcoming debut airing of our very first SEMA Battle of the Builders competition,” said Chris Kersting, SEMA president and CEO. “A lot of thought and hard work went into both the competition and the television production. The first-ever SEMA Ignited event may have looked like a great party and car show, but Ignited was actually much more than that. The event was a way to show off the incredible cars, trucks and specialty equipment that our industry brings to the SEMA Show. It was also a means to interact with consumers, both on-site and through the media. The immediate social-media coverage was awesome, and now we have the longer-lead media pieces coming to fruition. The ’15 Omix-ADA Jeep Wrangler JK Sport featured at this past November’s SEMA Show has sold for $85,000 to benefit SEMA Cares charities. The sale came on the Barrett-Jackson auction block on Wednesday, January 16, in Scottsdale, Arizona. Known as the Rugged Ridge/SEMA Cares Jeep, the upfitted, dirt-ready vehicle was originally procured with funds from a 2013 Omix-ADA donation and contained a total of $30,000 in aftermarket parts and accessories from other donor companies, including Falken Tire, Super Chips, Rugged Ridge and Kicker. It was also clad in custom paint by Theresa Contreras from LGE-CTS Motorsports. Perhaps most notably, however, it was customized through a collaboration with the Alex Xydias Center (AXC) for Automotive Arts, in which a team of AXC students modified the standard four-door JK at the new SEMA Garage facility in Diamond Bar, California. All of the proceeds from the Jeep’s auction will go to benefit Childhelp America and Victory Junction. SEMA Ignited closed out the week of the 2014 SEMA Show with an afterparty like no other, and a public tribute to the best car builders on the planet. As the Convention Center doors closed and the trade-only Show ended on Friday, hundreds of custom vehicles roared to life, forming the now-traditional SEMA Cruise. This year’s exit parade had a different destination, however—straight down Paradise Road and on to The LINQ in Las Vegas. With the high-roller observation wheel in the background, the world’s first car show that exclusively featured cars from the SEMA Show opened to the public. Enthusiasts were over-the-moon about the chance to get up close and pose next to cars built by true automotive legends. What are some of the latest trends hitting the aftermarket in 2015? If you were in Las Vegas this past November for the annual SEMA Show, you likely already have some answers to that question. There’s no better barometer than the Show to preview the hottest products and innovations taking hold of consumers. The following are just a few of the latest trends that SEMA News editors observed not only grabbing attention on the Show floor itself but also in post-Show media wrap-ups afterward. What do a car dealer, a former Navy SEAL commander and a financial advisor have in common? They were all recently elected to serve in the U.S. Congress. As a result of the November midterm elections, a lot of new faces have arrived in the nation’s capital. Fifty-eight first-timers were elected to the House of Representatives and 13 to the U.S. Senate. Among them are the future champions of the automotive specialty-equipment industry. While sorting through all of the new names may seem daunting, here are a few to keep an eye on. The GMC Acadia is reportedly moving to GM’s new Chi architecture, which is said to result in a slightly downsized crossover. This new Nissan Maxima test car has less camouflage around key elements of the design, including its C pillar and side-window profile. Breaking news from SEMA member companies, including Lucas Oil Products, Turn 14 Distribution, Luken Communications, Champion Oil and more. SEMA members are invited to take free tours of the SEMA Garage and enjoy breakfast through three SEMA Garage Tour dates—March 3, 10 and 17. The tours, which will take place on each of the dates from 9:00 a.m.–11:30 a.m., will take members through the Garage to learn of the tools available to developed and market products faster and more cost effectively. SEMA Show management has announced several key dates for companies interested in exhibiting at the 2015 SEMA Show, November 3–6, in the Las Vegas Convention Center. Exhibitors participate in the SEMA Show primarily to connect with buyers from throughout the world. The main objective of the exhibitor is to sell and promote products, and journalists are often attracted to the innovations that appear at the SEMA Show.